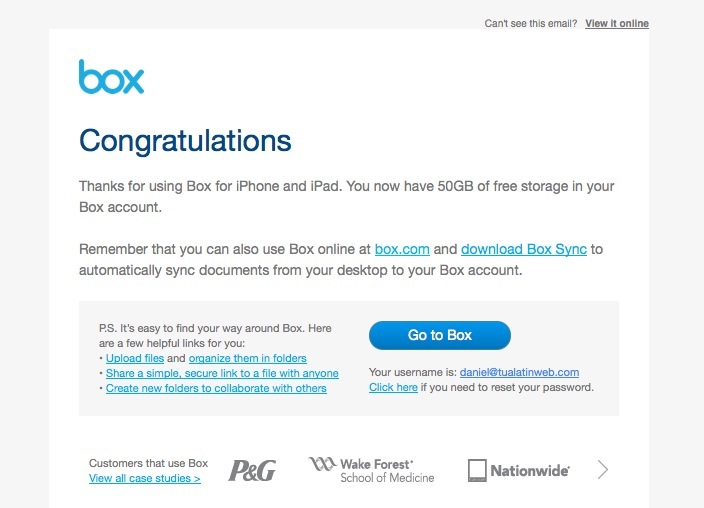 My social media and real friend Kevin Ferrasci O’Malley sent me an email this morning about this cloud storage company called Box, so I gave it a try on my iPad by downloading their special free App. Sure enough, I now have a new account all setup with 50GB of free cloud storage. Here’s the promotional link to get your 50GB of free cloud storage for iPad or iPhone devices. Long live free cloud storage. I think that companies like Box will make money when we all get hooked on the storage concept, and then go over our 50GB limit and start to pay a monthly fee. So far, I’m quite happy with my multiple free storage accounts. Thanks Joe, I hadn’t heard of Box Notes or Copy.com, thanks for the info. You will get 20GB Cloud storage after installing the client and register by mail.